Posted 8/9/2010 10:41am by Gregg Keckler. We are finally picking green beans again. Red, yellow, and pink raspberries are starting to come back. So in the weeks ahead we should have alot of them. If you would like blackberries this week, we will sell them again for $5.00/pint. Oliver butchered 25 chickens. They are aproximately 3 lb each and the cost is $5.99/lb. These are free-range, hormone-free chickens. We ate the first one roasted with vegetables. We basted it with a mixture of butter and coconut oil - Delious! If you want to order one let us know and we will include it in your cooler. and add it as an extra. These chickens are whole, dressed, bagged, and frozen. This week's shares will include: green beans, tomatoes, pepper, cantelope, peaches, kale/Swiss Chard/fennel, onion, cabbage. The list on the boxes is different. Ignore the box list and go with this list. Another point: PLEASE give us back the cardboard boxes! We have to pay $1.00/each for them, The tag holders cost 1.67 each and the plastic ties are .30/each. In addition if you recycle them you are wasting unnecessary fossil fuels to do so, when we will reuse them in the same form. Posted 8/9/2010 10:24am by Gregg Keckler. Posted 8/3/2010 7:14pm by Gregg Keckler. Some of you were wondering what to do with eggplant: we asked our subscribers to write with their favorite recipes. Here are just some of them! As for what to do with Eggplant, we were having a similar dilemma for a while and ended up coming up with a super-easy solution. We slice it up into quarter-inch slices, sauteed them just long enough to start getting them tender 3-5 minutes, and then tossed them on a pizza crust covered in pesto, slices of our tomatoes and bufalo mozzarella and baked it all. Deelish. E.W. I do eggplant parmesan or roast eggplant spears after battering them with bread crumbs, kind of like fries. J. For the eggplant….Slice lengthwise (from top to bottom). Marinate 10-20 minutes in ziplock bag (marinade recipe below). Throw on the grill and eat alone or on sandwich with other grilled veggies (such as squash, red pepper, Portobello)! Parmesan, which is what we've been doing with our eggplant. mix the ricotta, mozzarella cheese, basil and 1/4 cup Parmesan cheese. on a baking sheet. Bake in preheated oven for 10 minutes on each side. layering process until all the eggplant and cheese mixture is used. bubbly and top is browned. Take two eggplants and put them under the broiler until the skin blackens and blisters. Let them cool and skin them. Mix them into a casserole dish with two diced tomatoes, a tablespoon of dried mint and black pepper to taste. Top with 6oz goat cheese, and bake on 425 for about 20 minutes or until the cheese has melted and lightly browned. Put tomatillos in a 2 quart pan and just cover with water. Bring to a boil. Simmer about 7 – 10 minutes. Tomatillos will soften and begin to split open. Remove from heat and drain. Put all ingredients and the cooked tomatillos into a blender and blend using the pulse button until the mixture is the consistency you want. Note: Use non-reactive cookware to cook the tomatillos and to store the finished sauce in. Non-reactive containers and pans are usually made of stainless steel, enamel, glass, plastic, or clay. An easy thing to do with eggplant is to slice it, let it drain a bit, and then brush on olive oil & garlic and sprinkle with salt. Cover a baking/cookie sheet with parchment paper. In a pie pan dish, mix bread crumbs, parmesan cheese and dry seasoning mix. Peel eggplant and cut into ½ in thick circles/rounds. Completing one circle at a time, spread a thin layer of mayonnaise on each side of the circle, then press each side into the seasoned bread/cheese crumbs. Place on a the prepared baking sheet. Bake for 20 minutes or until golden brown on the top. Remove sheet and flip rounds. Bake an additional 20 minutes or until second side is also golden brown. One of the easiest things to do is grill it (you can broil, as well). We oftentimes grill a whole assortment of vegetables and its always a great hit. Allow to rest for 5-10 minutes and then serve. My favorite vegetables to add are mushrooms, red/yellow peppers, squash, zuchini, and red onions. We made eggplant dip — good with pitas! Roast eggplant on outdoor grill until soft (much like roasting a pepper). Peel. Put in blender/food processor to puree. Add some garlic, olive oil and red wine vinegar. Blend together. The roasted eggplant is also good if cubed and served on pasta. Posted 8/2/2010 9:58am by Gregg Keckler. August is here! Time for corn, tomatoes, and cantelopes! We are picking blackberries by the tons. If you would like to purchase any extra blackberries, we will sell them to CSA folks for $5.00/pint. You can freeze them or make jam with them. Email us if you are interested. I have gotten quite a few deparate emails from folks asking what to do with eggplant. If anyone has any good recipes for eggplant, please forward them to me and I will put them on the blog for others to use. It might help if folks have any recipes for using tomatillos. Please let us know. Today Oliver and Sarah are butchering chickens.. Oliver decided to raise some free range meat chickens this year. They decided to butcher the 12 largest birds today. Next week they will do 20 more. Oliver has about 50 more that won't be ready until September. We will let you know particulars about buying them once they are frozen. As in past years we are having our neighbor, Mark Tuckey grow our corn for us. We have done this for a while and it seems to work well. Sweet corn takes a lot of space, equipment and spray. We just don't have time for it so Mark does a great job. We will have yellow Incredible and Mira, a bi-color. Posted 7/30/2010 9:14am by Gregg Keckler. Thank you for the wonderful produce this past week. My family ate through the plums like crazy and the potatoes and green beans are gone too. I made a small, very delicious batch of blueberry jam in my bread machine that is just heavenly. We’re looking forward to some grilled squash as a delicious side to our dinner tonight. I got my CSA on Wednesday at Suburban Outpatient Medical Center and it was great! I already have sampled most things and I am very happy with everything! Thank you for doing such a great job. Also, the driver was really nice and helpful. I have really enjoyed doing business with your farm. Posted 7/19/2010 8:23am by Gregg Keckler. The rain was needed! Very refreshing! We are pulling lots of carrots, beets, eggplant, and some tomatoes, but not quite enough yet. The peaches are juicy and sweet. They tend to be softer this year than last year. They will probably not keep for an entire week. So check them ofter and eat them when they are soft. There are alot of plums - purple/yellow are Methley plums, red/yellow are Cardinal plums, and yellow plums are Shiro. The raspberries and blueberries are slowing down at the moment. The raspberries will be back heavy in August. We hope the blueberries will pick up again now that we had rain. We are looking forward to the summer produce and fruit. We will probably have sweet corn in two weeks. Looking forward to somw great stuff. Check your emails. If you wish to order extras order by at least the evening before pick up day. This week's shares will include: peaches, plums, carrots, beets, potatoes, eggplant, blueberries/blackberries. Have you noticed a lot of finches this year. I have noticed several different kinds. They love seeds, Keep your eyes out for them. Enjoy those birds. Posted 7/19/2010 5:32am by Gregg Keckler. Here are a few more recipes that we have received from CSA members who have tried them and given them the thumbs-up! Hopefully you will be able to try some of these and find them delicious! Preheat oven to 400. Blend almond paste and 3 tablespoons sugar in processor until finely chopped. Add cream cheese, egg yolk, and vanilla and blend until smooth. Unroll crust on heavy rimmed baking sheet. Spread filling over crust, leaving 1 ½ inch plain border. Arrange apricot quarters, rounded side down, in spoke pattern in 2 concentric circles atop filling. Fold dough border up over edge of filling. Brush exposed apricots with warm jam and sprinkle with remaining sugar. Bake crostata until crust is golden brown and apricots are tender and slightly browned, about 45 minutes. Cool 30 minutes. Serve warm or at room temperature. Serves 8. * Giant sells almond paste in 7 ounce logs. Leftover freezes well. Just defrost before using. Preheat oven to 350 degrees. Butter a 9-inch square baking dish, and dust with flour, tapping out excess. Make the topping: Stir together butter, flour, sugars, salt, and cinnamon. Make the cakes: Whisk together flour, baking powder, and salt in a bowl. With a mixer, cream butter and granulated sugar in another bowl until pale and fluffy. Beat in eggs and vanilla. Working in alternating batches, add flour mixture and buttermilk, beginning and ending with flour mixture. Beat until just combined. Pour into prepared dish, and smooth with an offset spatula. Dot top with cherries, and sprinkle with crumb topping. Bake until golden and a tester inserted into center comes out clean, about 1 hour. Let cool before cutting. Can use canned whole beets or fresh beets boiled and peeled. Tastes phenomenal on a hot summer day. Can be used for a light lunch as a main course or even dinner. add milk to vegetables, dill, and eggs and stir. Soup should be pink to dark pink in color. The more beets you add, the thicker the soup becomes and the darker pink it turns. Add salt, start with 1 tsp, taste, salt to taste. Put in fridge for 1 hour so the flavors can blend. Serve with boiled potatoes (the best are new red tiny potatoes) flavored with dill and sprinkled with a little butter. My children put the hot potato right in the cold soup-Yum! Posted 7/12/2010 3:32pm by Gregg Keckler. Welcome to the 2010 CSA season. If you are getting this email, you should be expecting to pick up a share on July 20, July 21, July 22 or July 24 for the first week of the second session. If you don't think you should be picking up this week, let me know. For some this is a new experience, for others it is a continuation of fresh fruits and vegetables. We want you to get the most out of the fruit and produce that you get. We have some simple preparation tips on the website. Remeber that you do not need to create a dish based on a vegetable ( for example: asparagus) Asparagus is delicious raw, lightly steamed, or grilled - no other ingredients necessary except a little butter or olive oil and salt. Preparing simply will give you the best flavor and nutritional value - and it is simpler. Logistics: All folks getting their shares on Tuesday at DOT or Gangplank Marina, Thursday at East Columbia Library, Saturday at Cedar Lane UUChurch in Bethesda, Saturday at 128 Goucher Lane, Gaithersburg, or Saturday at the Westminster Farmers Market will pick up coolers each week. You will bring back an empty cooler and pick up a full one. If you choose you can put your items in your own bags and just leave the cooler with us. Folks getting shares on Wednesday at NGS, NLC, Calvert Foundation, NIH - Fisher Lane, Suburban Hospital or Suburban Hospital Outpatient your produce will come in a box with your name on it. You can take the produce and leave the box in the designated drop off spot or you can take the box with you. Please return the box before the next Wednesday pick up. Extras: you can order extras weekly by sending us an email AT LEAST one day before delivery day. You can pay for the extras at the market with cash, check, or credit card(If over $15.00) If you pick up on Wednesdays or at the Gangplank Marina, or Gaithersburg you can order items, we will put them in your share and at the end of each 7 week session we will send you a bill by email and you can send us a check by mail. We will have our own fresh, free range eggs all year. Our chickens are young and laying prolificly. We will have our own hormone-free grass fed beef available. We are having another steer butchered this week so we should be stocked with all cuts of steaks for a while. We will also have our own sweet butcher bologna. We put a whole steer in bologna so the bolonga is Lean and delicious. 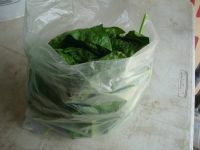 Butcher bolonga is stored in 4 in round cloth bags. We sliced it thinly and put it in 1/2 and 1/4 lb packs to sell. We also sell butter from Apple Valley Creamery www.applevalleycreamery.com The butter is from hormone-free pasture fed dairy cows. We will again be offering Ed Breckenbill's cheese. Ed has a hormone-free pastured dairy in Chambersburg, PA He makes all of his cheese at his farm. He adds no additivies, only raw cow's milk, vegetable enzymes, and sea salt. Posted 7/12/2010 10:05am by Gregg Keckler. For some of you we are saying goodbye. We hope you have a great summer and join us again next spring. For others who are in it for the long haul, this is 1/3 of the season. Now we will be getting into summer fruit: plums, peaches, blackberries, (more) blueberrries, cantelope, and pears. The rain last Saturday was bad for the markets, but great for the vegetables. If this is your last week, please be sure to bring your box back to the designated spot by next week. If your location will not be getting any drop off for the next session (ie Kennedy Center) our driver will stop at your location next week to pick up emtpy boxes. We will be sending out bills by email for extras ordered during this session. Please send a check promptly so we can get them cleared up before the next session gets under way. Your shares this week will include: Lodi/Transparent apples (tart, cooking), black walnuts, plums, green/yellow beans, cucumber, squash/zucchini, carrots, sweet banana peppers. Posted 7/12/2010 9:56am by Gregg Keckler. This is the seventh week and the last week of the first session. So we are doing things differently this week. Bring back your empty coolers or boxes. BRING YOUR OWN BAGS! Cloth bags are best. It is your turn to pick off the table and make your own share. If you have a half share, you can pick $22.00. If you have a full share you can pick $35.00 of produce, fruit, bakery, honey, jam, etc. If you wish you can use your share money for extras - beef, bologna, cheese, eggs, butter, If you do plan to get extras, please email us with your order. We do not automatically bring extras to each market and we do not bring any steaks that are available only to CSAs. So please order them. ATTENTION: DOT pickups Do not plan to come before 8:30-9:00. The tables will not be set up until then. ATTENTION: Gangplank Marina- Your shares this week will include: Lodi/Transparent apples (tart, cooking), black walnuts, plums, green/yellow beans, cucumber, squash/zucchini, carrots, sweet banana peppers.